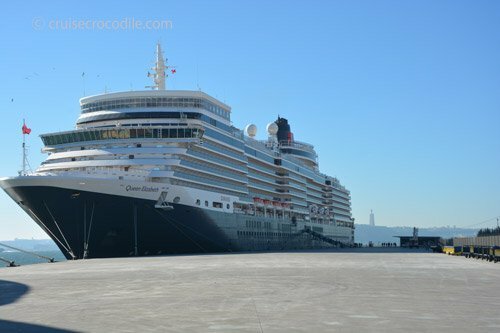 Our Lisbon cruise port guide gives you information about the docking location, cruise dock, transportation options and much more! 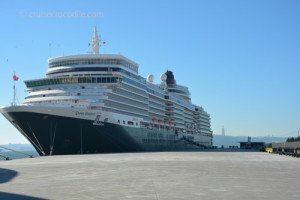 Welcome to the Lisbon cruise port guide. This massive city of 2,7 million is something different. It is not just your ordinary Portuguese city. Lisbon is Lisbon which is a character on its own. It is the capital city of Portugal that also serves as the political centre, cultural centre and according to the locals: centre of the world. 27% of all Portuguese live in Lisbon and you could imagine how far stretched out the city is. There is always something new to find in this town. On your 150th visit you can still explore something new in the town and that is what makes Lisbon absolutely unique. You can never get bored with it. The city lays a couple of km up the Tagus river. This is the famous river from which the explorers departed on their voyages to the unknown. Many buildings and even neighborhoods still remind up of these times in the 15th and 16th century. We refer to this era as the age of the discoveries. The time when Henry the Navigator and Vasco da Gama would remap the world. All that wealth that came back from the new world had been put back into Lisbon and that is what makes it architecture absolutely unique. However they city has been destroyed by an immense earthquake in 1755. 85% of the town was destroyed and thousands were killed. Lisbon rebuild the city centre with the help of Marques de Pombal. He was a visionairy. Instead of rebuilding the medieval town he decided to demolish the remains of the earthquake and rebuild the downtown in accordance with the modern urban rules. The result is that Lisbon and its urban planning became an example for the rest of Europe. This is the port where most of the cruise ships dock when calling into Lisbon, but remember that your ship could also dock near the bridge. Assuming you are docking at the Santa Apolonia, it is about 1 or 2 km walk to the main square of Lisbon. There is a tiny cruise terminal in front of your ship. There are a couple of docking options in Lisbon. St. Apolonia is the one that is normally the one. This is the terminal in Lisbon. Find city maps inside the terminal to bring with. 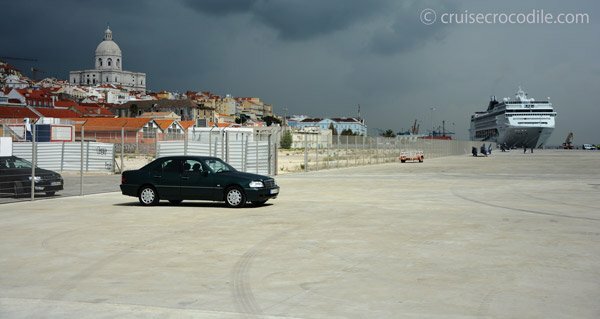 Lisbon has got many spots where the cruise ships can dock. Most cruise ships dock at the Santa Apolonia Passenger Terminal or Doca de Alcantarar. Lately we notice that in general it is only the Santa Apolonia Passenger Terminal that is being used for cruise ships.The nice thing about this one is that it is close to the centre of town. You can simply walk in. Depending on where you are docking, generally you dock about 1 or 2 km away from Praca do Commercio (Lisbon’s main square). See above what your docking options are. 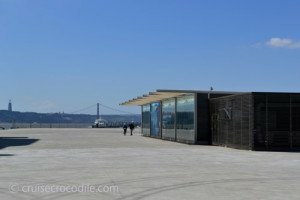 At this point Lisbon is building a new cruise terminal. The ones that they have now are still very nice though. There is not a representative of the tourist information, but there are maps available however. Other than that not many facilities. If you dock at the St. Apolonia area that you have plenty of options when it comes to transportation. There will be taxis there, metro, bus and hop on hop off bus. There are plenty of taxis on the dock. If there are non available, just walk to the main road to hail one on the street. Taxis often have a beige color and they have a meter. Most rides from the Santa Apolonia Passenger Terminal to the city centre are under 5 euro if the driver drives on the meter. You can also opt for a taxi tour. A simple taxi tour around Sintra and back to the city should be about 70 euro. Lisbon has an extensive bus, tram and metro system. Especially the metro is very usefull in Lisbon. It can take you through town in a few minutes and it doesnt cost much (around 2 euro). The metro is available at the Santa Apolonia Passenger Terminal. There are several hop on hop off bus companies in Lisbon. They are a nice way to get around especially is you consider that Lisbon is such a big place. The lines are time consuming, keep this in mind when planning your day. You’ll find the hop on hop off busses at the terminal, no matter where you dock. – Where can I see Fado? In the evening you can check out the Chaido area. We marked it on the map for you. Sailing into Lisbon and up the Tagus river is absolutely beautiful. You will sail past most of the highlights Lisbon has to offer. Check here what your sailing route is and what to see along the way. If you want to escape the busy centre, go to the Cais do Sodre train station (30 minute walk or 6 euro taxi ride) and pick up the train to Cascais. Enjoy this beautiful sea side village without to much hustle and bustle. Also known as the National Tile Museum. What would Portugal be without tiles? In the tile museum you will find the most unusual pieces of tile work and its history behind it. This 52 meter tall building is a monument commemorating Henry the Navigators 500th birthday. He stand tall with all the other historical figures from the age of the discoveries on the front of the monument. You can visit the museum and viewing platform. In the Jeronimos monastery we find the famous Maritime Museum. Learn all about the role of the Portuguese as pioneers in world exploration. See the tools, the ambitions and the conquests they have made in one of the most exciting times in history: the Age of Discovery. This late Gothic Manueline monastery is one not to be missed. It is one of the highlights in Lisbon and the jewel of the neighborhood Belem. There are tons of things to see and do in and around it. Take a 15 euro taxi, or tram 15 to it from the dock. Vasco da Gama and his crew spent their last night in Portugal in prayer before leaving for the unknown on a voyage that would find them the route to India. One of the things to see inside the Jeronimos monastery is the final resting place of Vasco da Gama. Find his large tomb in this church. One of the finest examples of Rococo architecture. If you like palaces like Versailles this is one not to be missed. Almost all rooms and the gardens are open to visit. This lift is a must see in Lisbon. It stands in the city centre and it connects the lower streets of Baixa with the 30 meter higher neighbourhood Largo de Carmo. It was designed by a student of Gustav Eiffel around 1900. Take it up for a ride or use the metro station for free to get to the higher neighborhoods. This historical church is about 10 minute walk from the ship. It is one of the very few churches in Lisbon to survive the earthquake in 1755. Because it survived so many earthquakes it is a mix of all kind of different architectural styles. Also known as the Basilica of the Sacred Heart of Jesus. It is a 18th century late baroque basilica not just known for its beautiful structure, but also for its hidden room where you will find this golden work or art with over 500 cork figures depicting the nativity scene. This tram is the most famous tram of Lisbon. They are historical trams from the 1930’s. They pass though many of Lisbon’s finest districts, including Baixa, Alfama and Estrela. It is a public tram so you can hop on and off where ever you want. See map for the closest and convenient locations to pick it up. 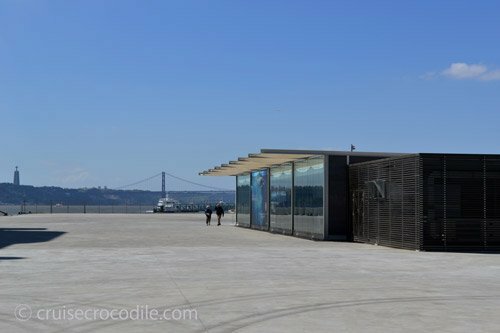 This is the Leixoes cruise dock. This new cruise terminal offers great facilities to arriving cruise passengers. Read the full Leixoes – Porto cruise port guide for all the information on where you are going to dock and how to get to Porto by bus or metro. If you are docking at the Santa Apolonia area that the district of Alfama is right in front of your ship. Explore it by foot to get a sense for medieval Lisbon. It truly is one of the most charming districts of Europe. From the ship, simply cross the road and aim in an uphill direction. Alfama is dotted with viewpoints. Keep your eyes open when you walk through this neighbourhood, you never quite know when the next best thing pops around the corner. This is the main square of Lisbon. From here you can start any journey through the city centre or beyond. It is a delightful square commonly known as Palace Square for the fact that this is where the palace used to stand before the earthquake of 1755. Most ships dock at the Santa Apolonia cruise dock in Lisbon. From here it is an easy walk to the Praca do Comercio (main square). You will find a trainstation nearby, a hop on hop off bus and taxis. Read the full Lisbon cruise port guide for tips on what to do in Lisbon and how to get there. Find this beautiful viewpoint in Bairro Alto and enjoy one of the most spectacular views over Baixa. See the map for its location. Obidos is a small town known for being one of the best medieval cities in Portugal. It hasnt changed much since it became a royal present in the 13th century. The castle, it small church, the cobblestone streets and medieval wall make it picture perfect. If you have already seen Lisbon before than put this one on the list. This UNESCO world heritage site is a unique tower from 1515 and for the last 500 years it has been guarding the entrance to the Tagus river and Lisbon. Over the centuries it has been many things and you can learn about its function and history inside in the Governor’s Chamber, King’s Chamber, Chapel and Battery room. In the middle of town you can find this beautiful station where you can catch the train to famous Sintra: the town of palaces. Tickets coast you just a few euro, trains go about every 15 minutes and take about 40 minute. The train station in Sintra is 1 km away from the city centre. This is the town of palaces. There simply is not a more charming town out of Lisbon. It never fails to amaze. The Romans already worshiped this town, as did the Moors. The result today is a town that has many palaces from many different era’s. Visit Sintra by train or taxi. Quinta da Regaleira When you visit Sintra there are tons of choices of which palace or castle to visit. We think the Quinta da Regaleira is a site in Sintra much overlooked. This romantic palace and chapel give you a whole new perspective of life if you can spare a minute. Make sure not to skip it.